2016 Weingut Von Schubert-Maximin Grünhauser, Riesling Kabinett, Abtsberg, Mosel, Germany. The beautiful Kabinett Abtsberg 2016 is a crystal clean and mineral driven Riesling that while off dry and generous has a dry feel and complexity of flavors that make it far more serious than you’d expect. Brilliant layers of classic green apple, lime and peach fruits along with hints of earth, wet slate and a touch of tropical essences all come through on the vivid light/medium palate, this wine really impresses for it’s detail and quality in the glass. The Maximin Grünhaus estate lies at the foot of a long steep south-facing slope on the left bank of the Ruwer river, about two kilometres before it joins the Mosel. The history of this place shines through in the wines and I am always intrigued to hear about it’s past, the estate belongs to the Von Schubert family and is divided into three separate but contiguous vineyards: the Abtsberg, the Herrenberg, and the Bruderberg. According to the winery, each of these vineyards has its own distinct micro-climate, gradient and soil composition, differences in terroir which explain the unique character of the wines made at Grünhaus. The Abtsberg wines harvested from this vineyard were originally destined for the table of the Abbot (or Abt) of the Abbey of St Maximin. The site covers 14 hectares, parts of which have been planted with vines for over a thousand years, set on blue Devonian slate and the hillside runs south-east to south-west, achieving a gradient (slope angel) of nearly 70%. 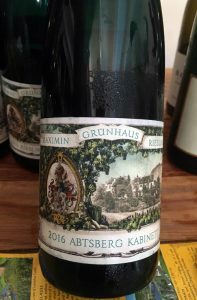 These Abtsberg wines, again according to the estate, are characterized by a finely structured subtle minerality, a racy acidity, generous fruit and great delicacy, of which I totally agree, especially with this Kabinett by Maximin Grünhaus, and they are also amongst the longest lived Rieslings of the region. Stefan Kraml took charge of viticulture and viniculture at Grünhaus. Since that time, the wines of the estate have benefited from his uncompromisingly high standards, the Grünhaus cuverie is sited conveniently close to the vineyards so that harvested grapes can be delivered to the press within a matter of minutes. Grünhaus employs a natural clarifying overnight via sedimentation, then the musts are brought to an optimal fermentation temperature, and fermented with naturally occurring wild yeasts (Sponti) in classic large oak casks (Fuder casks) or in some cases using small stainless steel tanks. These techniques promote optimal development of mineral intensity and fruit purity from the Abtsberg slate soils and ensures the longevity of their Rieslings. Neither the must nor the finished wine are fined and uniquely in the last two years most all the the oak for the barrels has come from the estate’s own forests, and the barrels are crafted by a local cooper, everything done here is to highlight their terroir. I love these wines, they are not flashy or overt, but oh so pleasing and stylish, they are like drinking in history, enjoy the Abtsberg Kabinett over the next 5 to 10 years.